“With Alex Smith's future still uncertain and with no healthy quarterback signed beyond this season, the Redskins need to find a young quarterback. With the 15th pick in the draft, they're likely in position to land one of the top four in the draft. The problem: If they feel the quarterback must sit for a year to develop, that pick won't help them now. They are in "win now mode". Unless Dan intervenes for "his guy", I can't see QB early in this draft. Only way we get a really good young QB is if we trade for Rosen and we don't appear to be in those sweepstakes at the moment (not yet anyway). The plan will be to strengthen the team around an above average-solid QB situation. - Finley with our 3rd rounder. Have to agree with Gruden's comments about taking a QB in the first round: you can't reach for them and pick them just because they are a QB. They have to be the one. Sensible philosophy in my book. Will be interesting to see how this plays out. I think they'll want possible starters or key 2019 backups in rounds 1-3. Need to to fill gaps when in "win now" mode. Historically, we only carry 2 QB's and have those already. I could see a day 3 QB because that player could end up on the PS if they don't carry 3. I don't think Rosen helps us if we're in a 'win now' mode. He didn;t look at all ready to lead an NFL club last year, he might as well be a rookie. Neither did Goff in '17. Point is though, people on this board have longer term planning in mind, and acquiring Rosen is a step in that direction, while I don't think our FO are anywhere near that level right now. They are mainly interested in 2019 and have clearly hitched their wagon to Keenum for 2019. I do not think its a certainty at this point in time that Rosen amounts to more than Keenum has shown to date. He is purely a development QB at this stage of his career. That much was obvious last year too. Keenum brings more to the table for this team this year than Rosen does. If we Draft a QB the next two years, with next year targeting our First Round selection to that task, I can't see how we are any worse off passing on Rosen, especially for the cost of acquiring him. We now with certainty our Second Rounder is not going to acquire Rosen. Its possible that same second rounder can acquire a Will Grier. Even then, I'd rather use out Top 100 Draft picks on shoring up holes on this team with impact Players regardless of the position they play. We need difference-makers on this ball club more than we need a Development QB in 2019, imo. Nothings certain with rookie QB's (even Rosen a year removed). However at least there is pro tape for a judgment to be made on Rosen playing in a Pro system. These other guys (as you pointed out in another thread), some have one year as a starter in a college offense. I agree with the view from the better draft experts that Rosen would have been a top 5 pick if he came out in 2019 and second QB off the board (noting Zona want Murray for THEIR new HC's system, the only reason they are not keeping Rosen). Whatever the decision, Keenum has more Pro experience (as does Colt) to start immediately over a rookie or even Rosen. The view to sit Rosen - or a rookie - for a year max, and let him learn the offense properly is the right strategy. It worked with Favre and Rodgers, right? There should be no pressure - internal or external - on the orgnaisation to play him immediately if he was acquired. Problem is all the talk from inside the organisation is the team is close and is ready to win now and they've hitched their wagon to Keenum (and Colt) at QB. That means they want to strengthen the areas outside the QB position to compensate. So yes, unless Dan intervenes directly, I can't see picks being used on a QB on day 1, or even day 2 to be honest. They have 4 picks in the first 3 rounds to plug the gaps around the rest of the team or improve certain positions with immediate impact, and I believe that is what they will do. Well, Goff and Trubisky looked way worse in my book as rookies and both led their teams to the postseason in their 2nd year. Rosen could be solid for us if we strengthen OL, TE, and WR. It could happen. They were part of a long term plan, not the Allen plan. ...unless God Dan wills it. For me I still think Keenum + Rosen is the best outcome for the QB both this year and the future. Colts a nice story - and his half against the Texans defense was the best from a QB we had all of last year - but is totally unreliable health wise. Given his gtd money, I'd find some way to stash him on PUP in case we need a backup in the back end of the season (like last season). Getting Rosen and still having 4 picks in the first 3 rounds of the upcoming draft is still the best outcome IMHO and enables us to address a number of significant issues. Well PC, I can't do Rosen for a First thing, so that renders that line of reasoning moot, though I agree with you otherwise. Rosen and Keenum in 2019 is good on paper...but I would still advocate trying to Draft another QB next year at the top of the Draft from where we sit today. If Murray drops past the Dolphins (Pick 13) which is where I think he will go I do not see the Redskins passing him up. Another ESPN Analyst ranks the rosters of the 32 NFL Clubs. 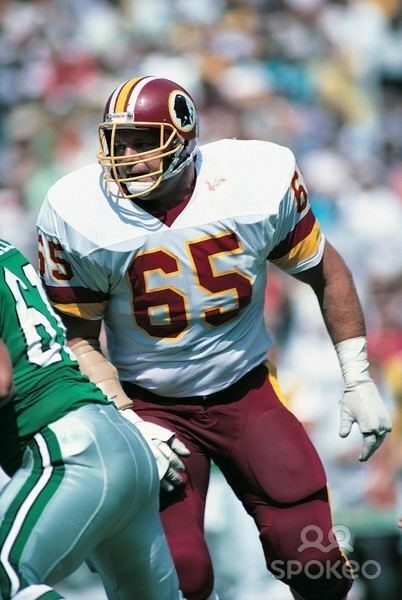 Unlike Bruce, he does not think the Skins are close. In fact, he sees the Skins’ roster as 31st out of 32 teams. Can’t say I agree, but what do I know? Murray gets to us? Thats the pipedream of the millenium. People need to stop using sites that are mocking absolute rubbish like that. That's why you don't trade top 100 Draft choices when you have a roster that looks like Swiss Cheese. 2) and what you're trading for fills an area of need that takes one need off the table over the next two drafts. Getting Rosen and #33 for #15, fulfils both requirements. 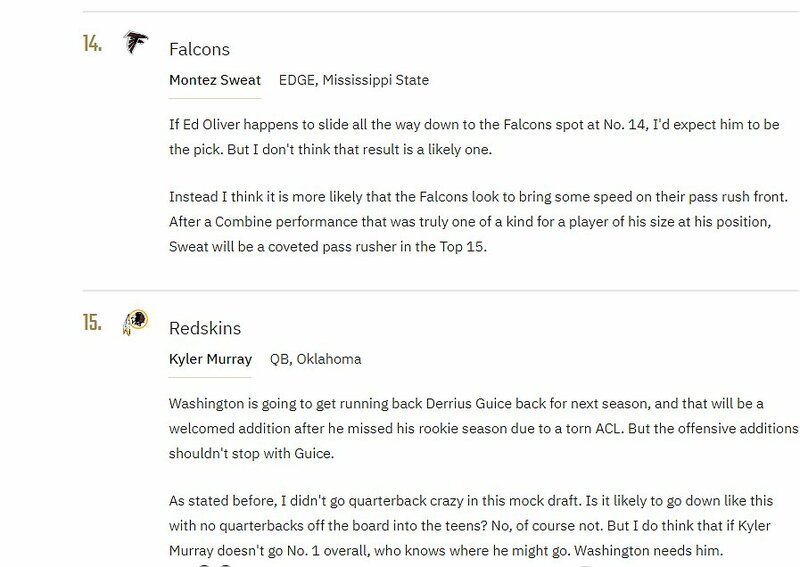 I just hope Kyle kills it with those 4 picks in the top 3 rounds. He really needs to! I am not sure BA will pick a QB with the 1st or 2nd rounder. I would like to see him trade back once or twice and pick up some additional picks and then give a late 1st for Rosen. The FO obviously elected to keep Smith by the 5th day of the new league year and we guaranteed another $12 million (I think it was). Many of us wanted to cut bait but this clearly did not happen. This tells me that BA thinks Smith will be back or at least he is not willing to face reality yet. This makes me believe that they will find a developmental QB in the 3rd or 5th round. They will see how he performs and when Smith can't pass a physical in 2020 they will know whether or not they need to use their 1st rounder on a QB. BA thinks that Keenum will be fine for 2019 with Colt and a developmental guy. BA will try and fix some holes and see what shakes out between Keenum, developmental QB, and most importantly Alex Smith for 2020. That's my two cents! God I wish the draft were here! I dont "use" it, I just read it, like all the other stuff I bump into on the net that's related to things I like. And I was willing to post that screen grab because we havent really talked about Murray becoming a Skin. A lot of stoopid stuff can happen in 14 picks, however unlikely. 1. Despite a number of feasible scenarios that could work (resulting in us acquiring Rosen and getting 4 picks insode the top 100), or unless Bruce is negotiating something behind the scenes that we're not aware of, or Dan is involved, Rosen isn't coming here. 2. We were on the hook for Smith's $12m gtd base salary regardless because it was gtd for injury. We cut him while he's injured he gets it anyway. Explained this some time back. I'm clarifying a point here, not saying Smith should have been retained anyway...as per my pinned thread I would have cut bait regardless. 3. The Skins don't keep 3 QB's as a rule, so I can't see a day 1 or 2 pick being used on one unless point 1 occurs with Rosen. If Rosen came out this year it would be first tier Murray, Haskins, and Rosen. Rosen would be gone by #10 despite his so-so rookie year. Then a drop off with Lock, Jones, and Finley being potential starters but also potential busts. Not a fan of Jones, too much loft which gives DBs time to adjust. Lock is probably gone by #15, Finley is a 3rd rounder IMO. So Rosen doesn’t look to bad but we need something back if we trade #15. Don’t think they give up 33 if the Giants are serious. The Cards have 11 picks, the normal 7 plus 4 comp picks. Their comp picks are late, two 6ths and two 7ths. My hope is that BA doesn’t give up #15 plus a bunch of late rounders. UDFAs have just as much chance to make the 53 as 6 and 7th rounders. If you mean with #37 from the Giants (as opposed to one of their first rounders) then I'll dispute that for value. The difference between #15 and #33 is far more valuable than #37 on its own. If you mean if their first rounders come into play well its Captain Obvious isn't it. Yep, something like the Giants #17 and a swap of 33 for 37. Don’t see how we beat that sensibily. The only counter to that is if Matt Ioannadis was thrown into the mix and what his value would be to the Cards, but for sure its getting into almost too rich territory if the Giants go there.